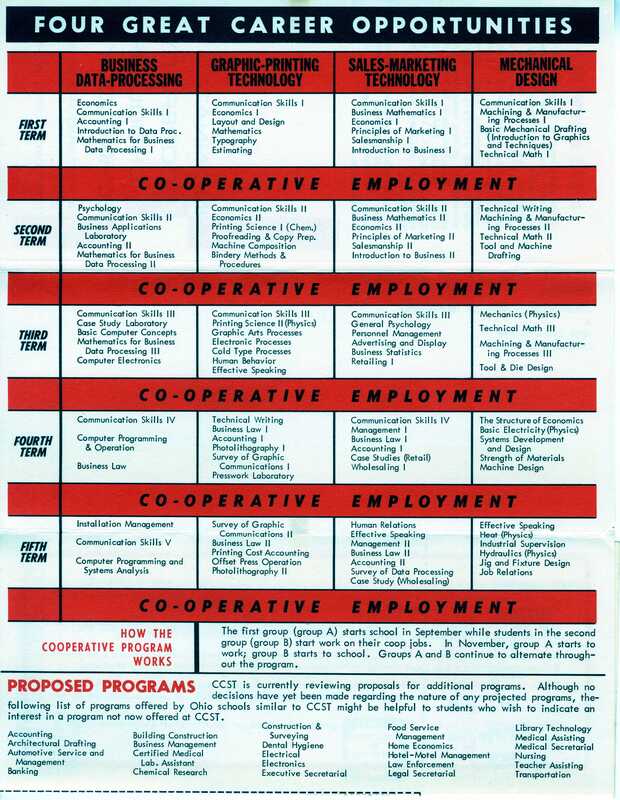 In 1966, spurred on by a shortage of qualified technicians in the Cincinnati area, the Cincinnati Co-operative School of Technology was introduced to the Board of Education. 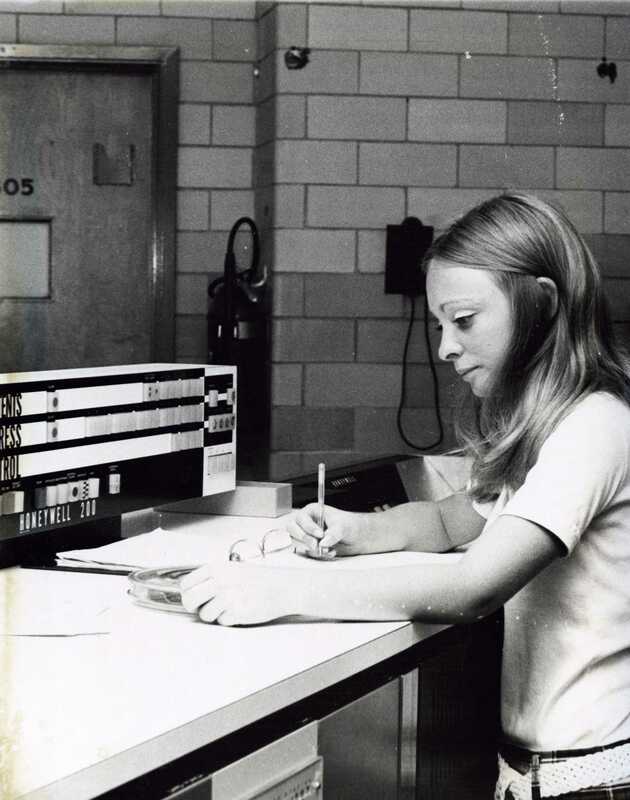 C.C.S.T., now Cincinnati State, opened in a wing of Courter Technical High School with 4 programs of study: Sales Marketing Technology; Graphic Printing Technology; Business Data Processing; Mechanical Design. 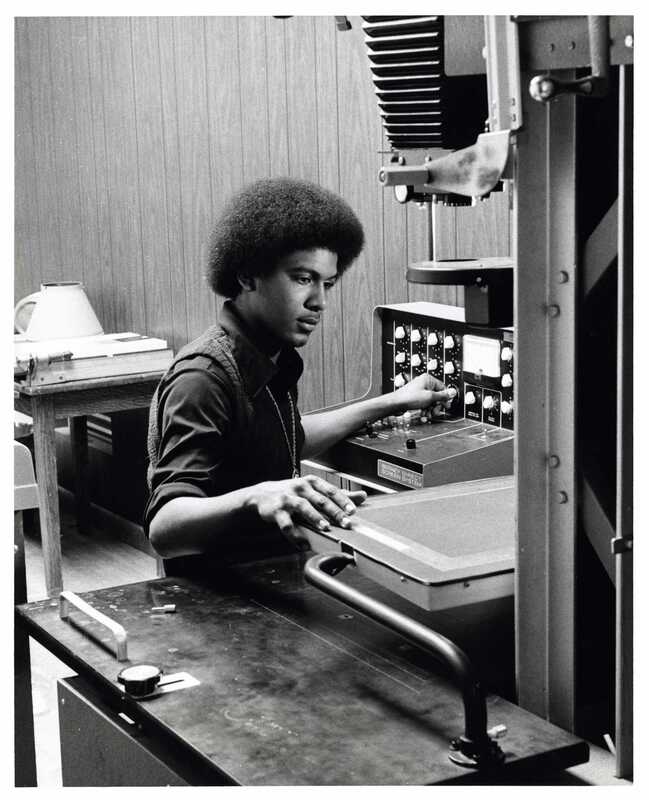 In 1967, CCST installed a $200,000 Honeywell 200 computer to train students in data processing. 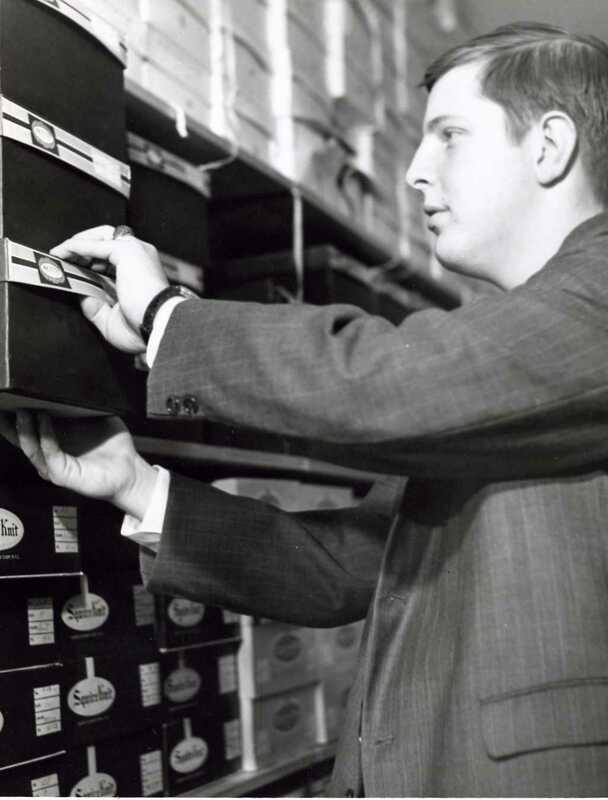 Pictured: Unidentified student in the Business Data Processing program, undated. 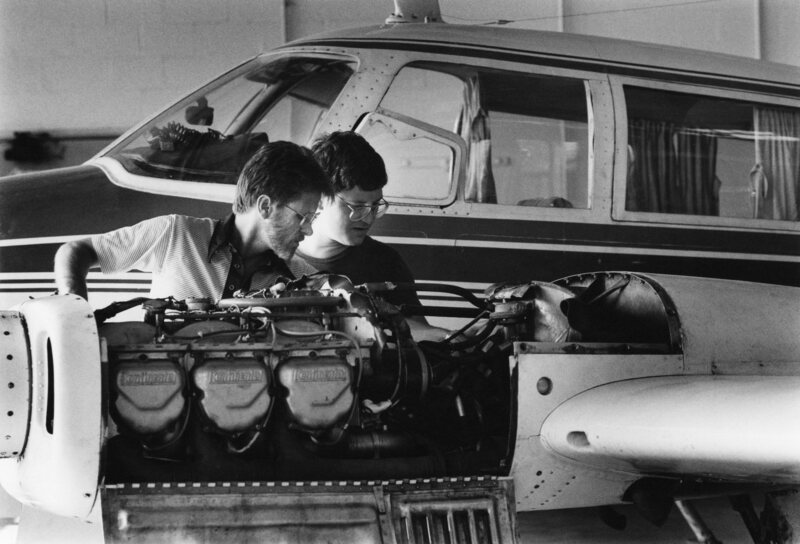 Center for Innovative Technologies: In 1992, the aviation maintenance program (started in 1970) was updated to offer a double major at the request of Delta Airlines which combined aviation and electronics engineering. Also, a special program was designed to teach writing and editing for technical manuals. Later, in 1997, Cincinnati State broke ground on its own airport at the West Campus. Pictured: Aviation Maintenance, undated. 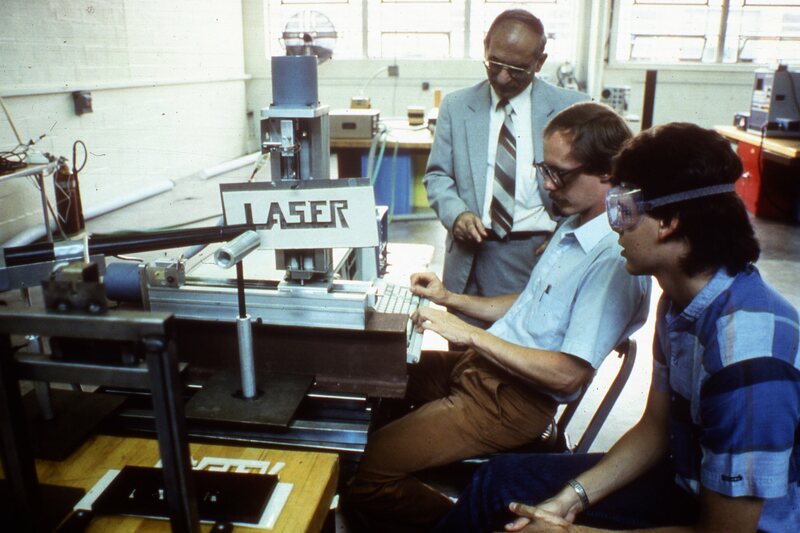 Center for Innovative Technologies: Laser Optics, introduced in 1978, was the first of its kind in Ohio. The program deals with the use of radiation for cutting, welding, drilling and scribing. Pictured: Faculty member Prem Batra and students, undated. Center for Innovative Technologies: In 1968 the college added Civil Engineering to its growing list of programs. 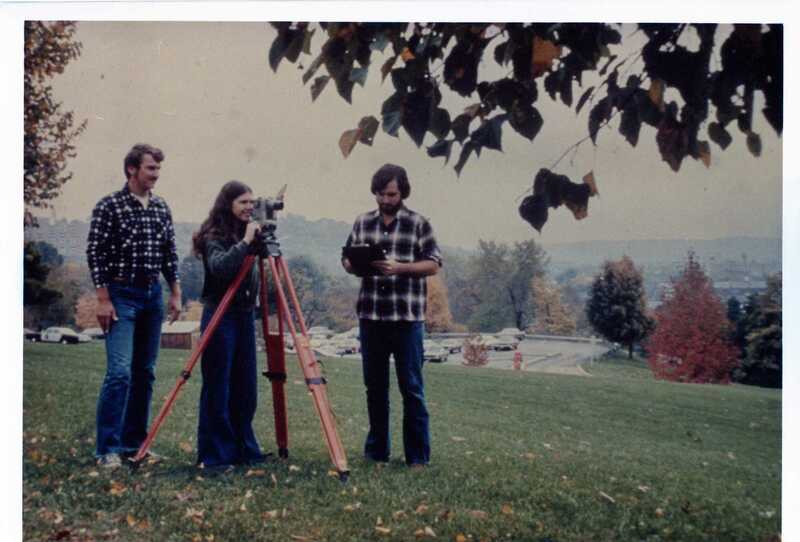 Pictured: unidentified students in the surveying track, photographed for the 1977 course catalog. 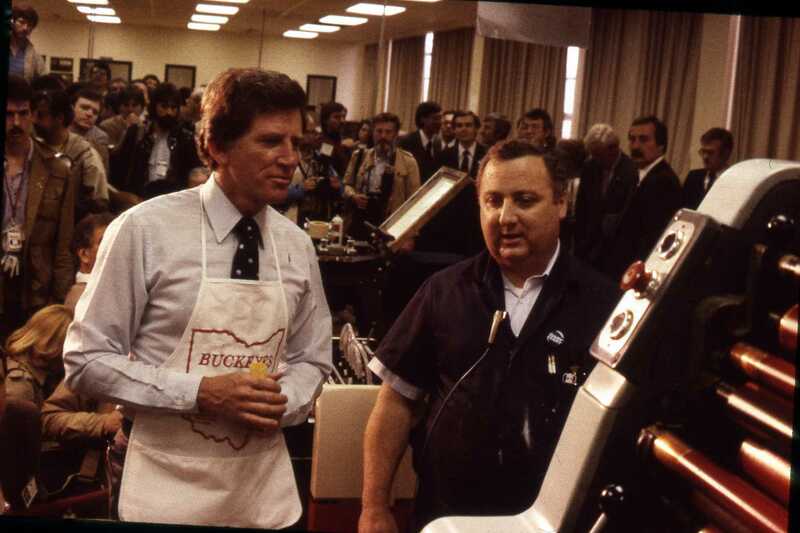 Business Technologies: In 1984, Presidential candidate Gary Hart paid a visit to Cincinnati State’s (then CTC’s) graphic communications department. Pictured: Gary Hart with graphics instructor Al Leicht, 1984.
Business Technologies: In 1968, CCST added six new departments, including Automotive Service Management, now under the Business Technologies Division. Pictured: unidentified woman, Automotive Service Management, undated. 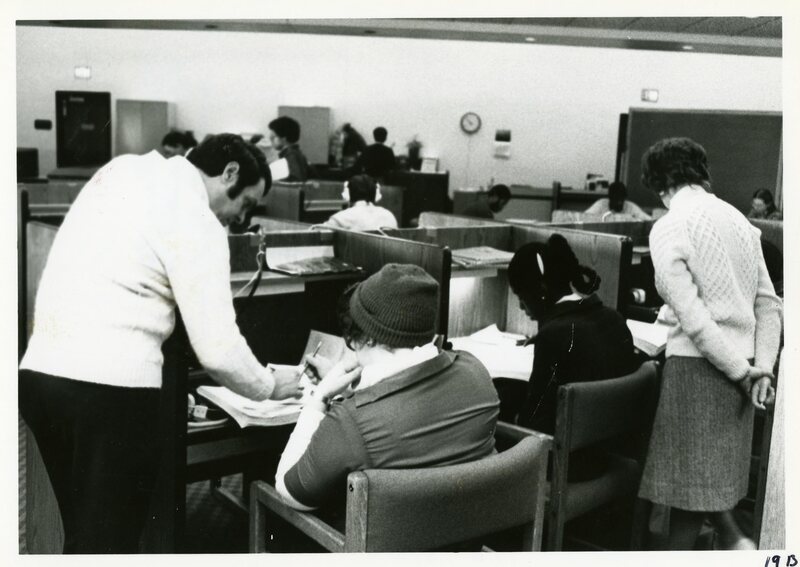 Business Technologies: Food Service Management and Food Service were also added in 1968. Then, in 2004, the Ohio Board of Regents approved a bachelor’s degree culinary program partnered by Cincinnati State and the University of Cincinnati. 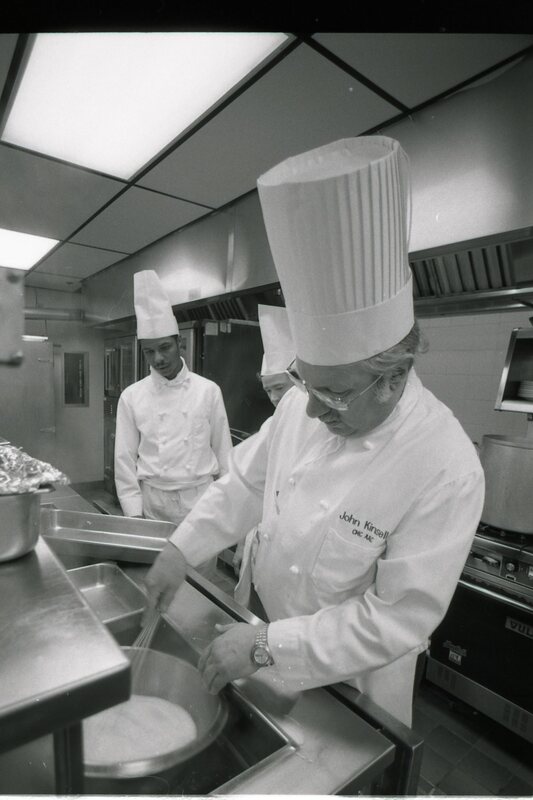 Pictured: Master Chef John Kinsella, instructor in the chef-technology program, Midwest Culinary Institute, circa 1990s. 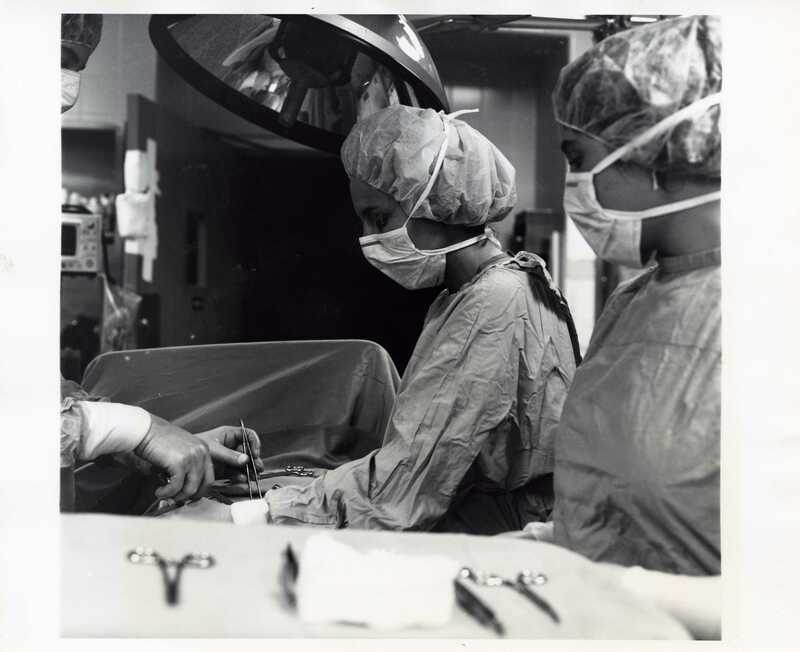 Health & Public Safety: In 1970, the surgical and urological assistant programs were proposed to the board of education. Pictured: unidentified students in the surgical assistant program, undated. Health & Public Safety: In 1999, Cincinnati State introduced an associate of applied science degree in fire-service technology, under the Health & Public Safety Division. 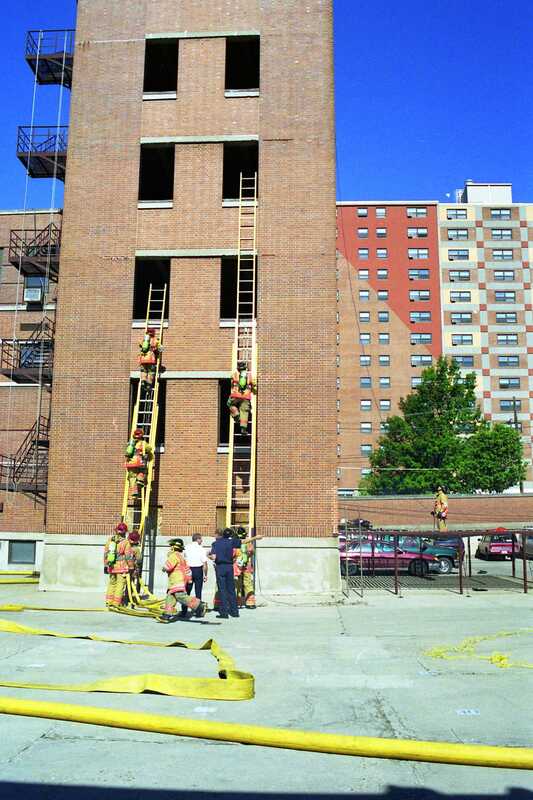 Pictured: Fire graduation drills, 1999. 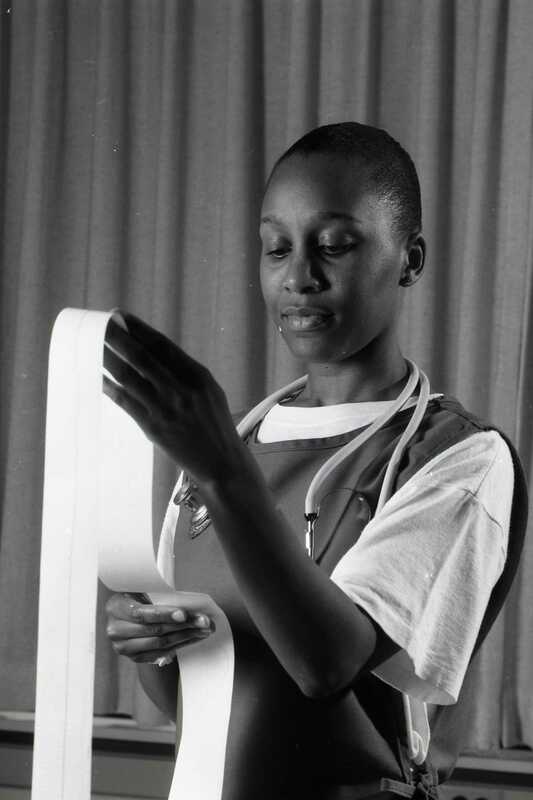 Health & Public Safety: In 1989, the college expanded its nursing school from a hospital-based diploma program to an associate degree program. The students were trained at the college, then CTC, and Bethesda Hospital. Later, in 2009, it was announced that the college would take over Great Oaks Career Campuses’ practical nursing program. Pictured: unidentified Health Sciences student. Photograph taken for the 1994 catalog. Humanities & Sciences: In 1993, the Board of Education was petitioned again. This time to convert Cincinnati Technical College into a state community college. 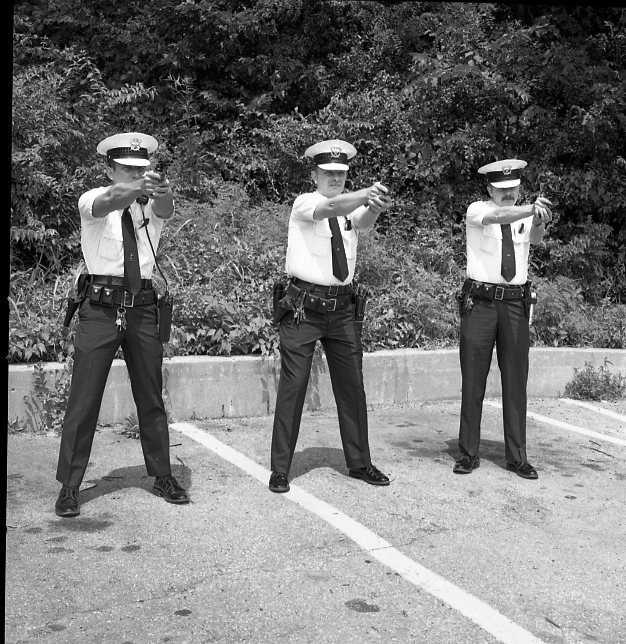 Pictured: Undated photo of law enforcement, one of the departments under the Humanities & Sciences division. Humanities & Sciences: As a community college, Cincinnati State was able to add academic courses in fields like anthropology and history. Students could now earn new associate degrees, with easier transfer of credits to four-year schools. 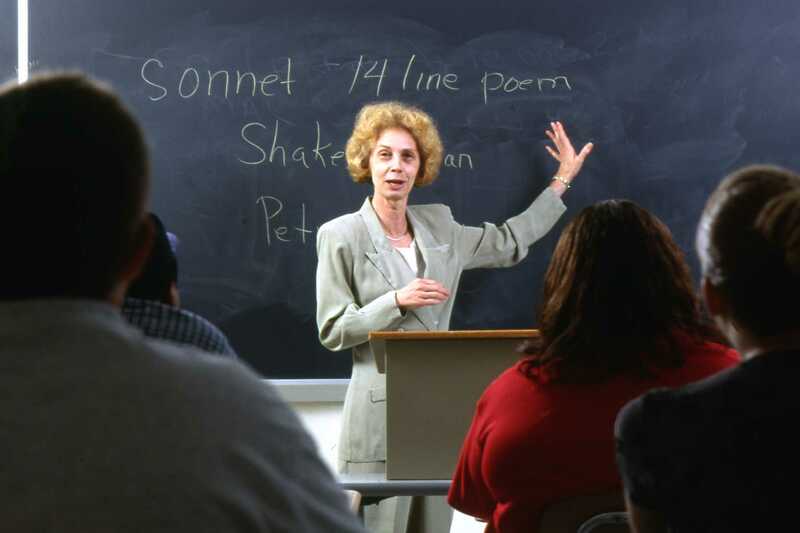 Pictured: faculty member Cathy Rahmes, undated. Humanities & Sciences: Developmental courses are also available for students whose placement scores indicate a need for additional coursework in reading, writing or math. 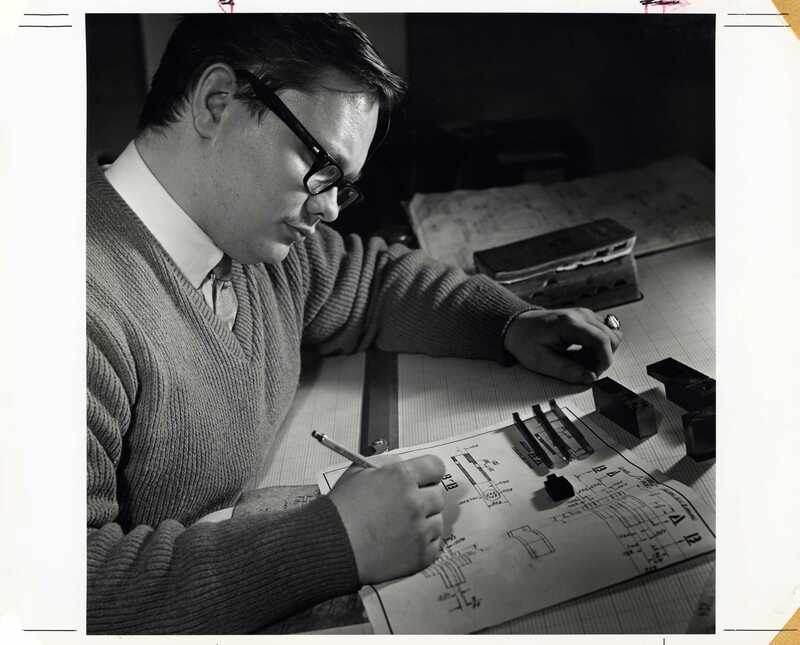 Pictured: James Marcotte, Developmental Education Specialist, Math & Science, undated.